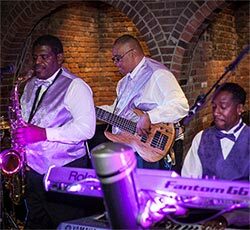 “Le’ Mixx Band!” Based out of the Hamden/New Haven area they have quickly become one of the most dynamic and entertaining dance band on the east coast. From weddings to corporate events, concerts, private parties and clubs, Le’Mixx will perform anywhere in the U.S. and abroad. Being primarily a classic R&B, Funk, Soul and Reggae review band, Le’Mixx is capable of pleasing the crowd with it’s wide array of music covering many genres. From Bruno Mars to Marvin Gaye to the Stones to Miles Davis. When Le’Mixx starts layin’ that groove, you’ll know it’s time to move!